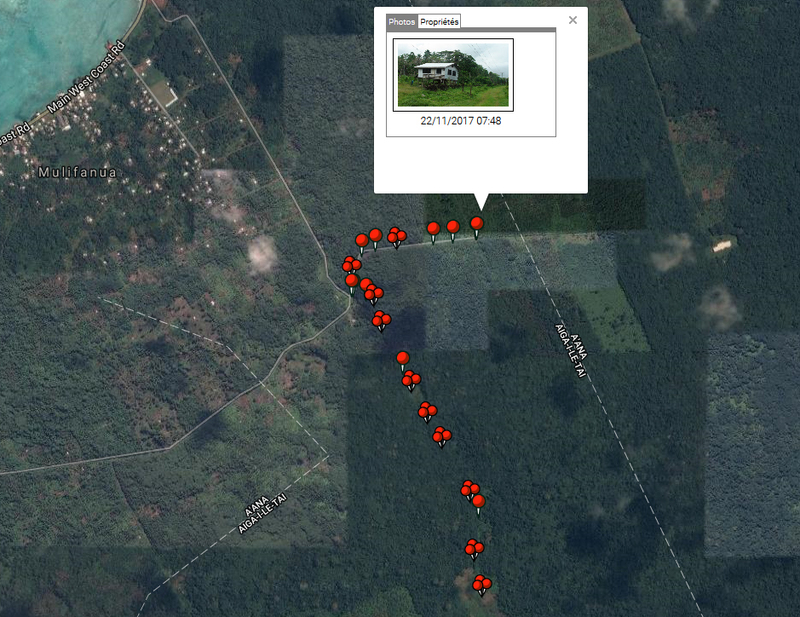 This website returns the information collected during four scientific visits conducted in 2001, 2010, 2012 and 2017 on behalf the Ministry of Agriculture of Samoa, the International Coconut Genetic Resources Network, the Secretatiat of the South Pacific Community, the Global Crop Diversity Trust, Bioversity International, CIRAD (French Centre for Agricultural Research and Development), the Coconut Industry Development for the Pacific (CIDP project) and the Darwin Initiative "Saving Pacific Coconuts". 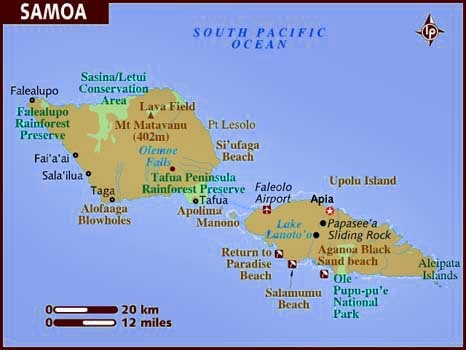 Samoa, officially the Independent State of Samoa, formerly known as Western Samoa, is a sovereign state in Polynesia, encompassing the western part of the Samoan Islands in the South Pacific Ocean. 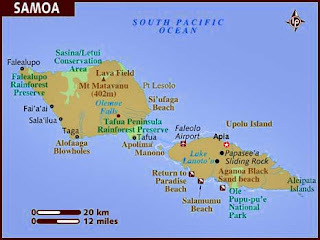 The entire island group, inclusive of American Samoa, was known as the Navigators Islands before the 20th century because of the Samoans’ seafaring skills. 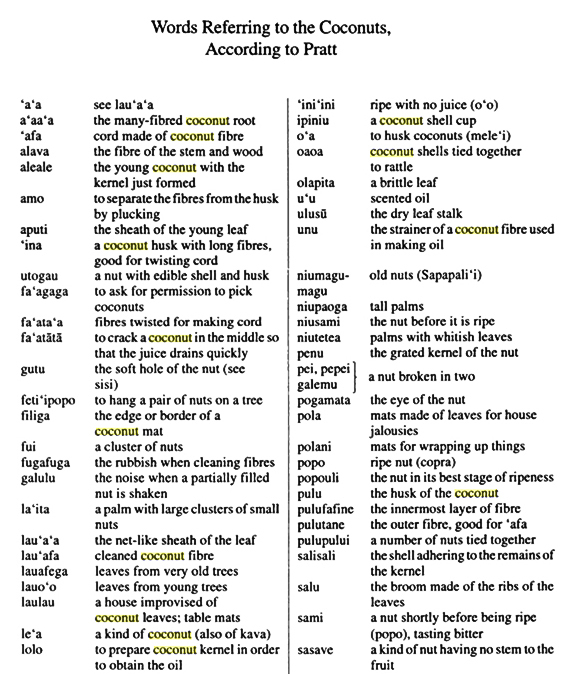 Coconut is the most predominant crop grown in Samoa. Its traditional value and multipurpose uses make it one of the most important crops in the everyday lives of Samoans as an important source of food and cash. 1. The UK Darwin Initiative project "Upgrading and broadening the new South-Pacific International Coconut Genebank" (reference 23-008) runs from June 2016 to March 2019. 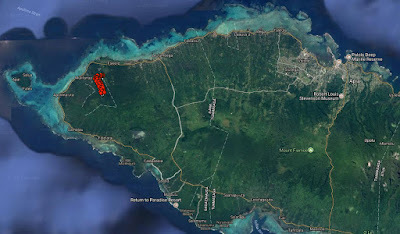 This project is being coordinated by Bioversity International; COGENT (the International Coconut Genetic Resources Network) and CIRAD (Centre de coopération Internationale en Recherche Agronomique pour le Développement), and is implemented in collaboration with: the Asia and Pacific Coconut Community (APCC); the curator of the South Pacific International Coconut Genebank (ICG-SP) hosted by the Cocoa Coconut Institute (CCI) in Papua New Guinea; the Global Crop Diversity Trust (GCDT); Government relevant ministries from Fiji, Papua New Guinea (represented by Kokonas Indastri Korporesen, KIK) and Samoa; and the Pacific Community (SPC). How to prepare leaflet samples for molecular analysis of coconut varieties. (R. Bourdeix & al, 2018. Coconut palms of Samoa. https://coconutsamoa.blogspot.com). In 2017, MAF is officially releasing only the Samon Tall variety, but some hybrids and Dwarfs (niu le'a) are also sold in small quantitites by Nuu research station. niutetea is described as palms with whitish leave, it may be Dwarf-types with yellow or orange fruits, that generally have palms of lighter green color. Pratt, G. (1893). 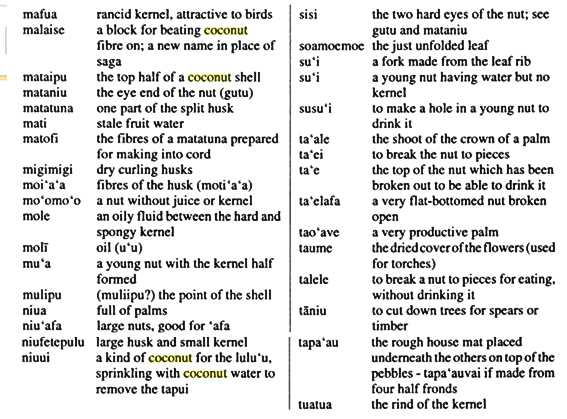 A Grammar and Dictionary of the Samoan Language, with English and Samoan vocabulary. London Missionary Society. held in Nuu Research Station as of November 2017. Niu leka Samoa small nuts? Niu leka Samoa big nuts? In Samoa, there was two recorded Niu le’a populations, one with big fruits, the other with small fruits. I will be good to precise which kind on Niu le’a are conserved in Nuu. Some of the niu le'a seems to be off-type with a growth typical to Tall-type varieties. Expert advised to replace the abnormal, off-type and dead palms. A new coconut public lecture ! 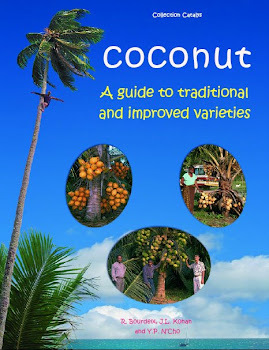 Order our coconut book !